Esoteric Advanced Energy Healing is applicable in every day life by anyone who desires to awaken their higher spiritual aspects and to live a life that is more fully attuned to the changing energy shifts of the New Millennium. It can help assist in that awakening. It is for those who are interested in, or already active in, some form of spiritual or meditation practices. This is a much broader spectrum of healing, and emphasizes the Wellness Stage versus the Disease Stages of older systems. It is a system developed to address the complex imbalances of people today; imbalances on the physical, etheric, astral, mental, causal, buddhic, atmic and monadic planes. The focus is to harmonise and balance energy centres known as chakras (especially the Heart chakra) and to raise the level of one’s consciousness. Esoteric Advanced Energy healing uses the traditional acupuncture/meridian points in specific sequences and patterns of combinations along with principles from the Jewish Kabala, Hindu Chakra System, Sacred Geometry, Spiritual and Energetic traditions. “The power of acupuncture is to harmonize and strengthen the body systems before a disease stage, but the power of esoteric acupuncture is to work with consciousness and strengthen the center which consists of the various levels of your heart”. Dr.Mikio Sankey – Author of Esoteric Acupuncture & Advanced Energy Healing. It does not aim to treat physical conditions, however its aim is to balance us on a deeper level. Esoteric Advanced Energy Healing encourages us to be deeper and have more profound use of our spiritual energies and consciousness within our lives. It can be quite useful in long term or stubborn physical ailments when there is some form of spiritual crises relating to the illness. A session is quite different from an Acupuncture session – as it can be performed without the insertion of needles. I treat using a tei-shin (a sterling silver blunt needle) which stimulates the points without insertion. We will go through which patterns are appropriate for you in your life now and why. Usually there will be some initial balancing patterns done first to help clear and balance in preparation for further patterns. All patterns involve the Chakras and often New Encoding patterns will be needed. You will be asked to follow along with the patterns and consciously work with the energy of them. These patterns balance the chakras, the aura and help balance the energies of our physical, emotional, mental and spiritual bodies. 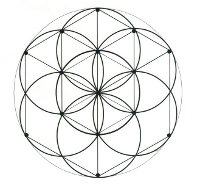 During the process some people are able to sense and experience the building of the supportive geometric patterns around them, others sense a change in their energy field. Whilst some feel a knowing, new understanding and obtain insights into their lives from a different perspective. Others just feel comforted like receiving a big hug. Often afterwards, people report that any blockages they had to issues in their lives have less impact on them or are now resolved.